Hello friends! I haven't done too many Christmas themed post this December so I decided this would be the perfect opportunity to do just that. 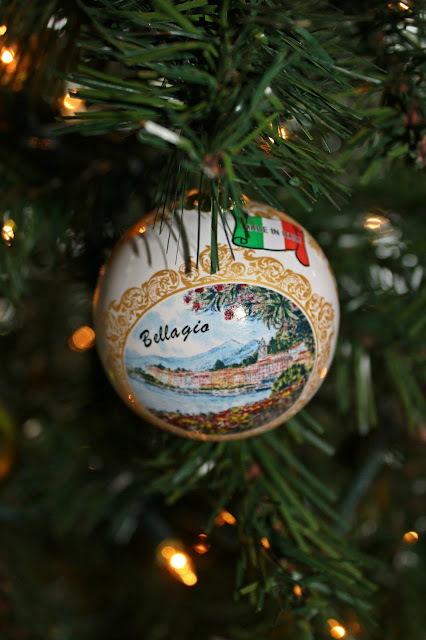 I'm linking up with lovely Jess from The Newly Blog for her Bits of Cheer link up party. For my bit of cheer, I thought it would be fun to show off some of my brand new ornaments direct from Europe. 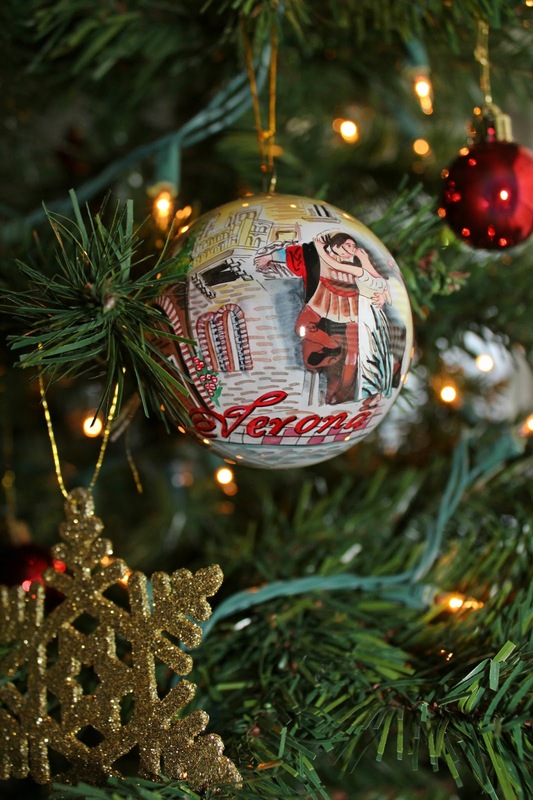 One of my favorite things during the holidays has always been putting ornaments on the Christmas tree. Especially my mom's Christmas tree because she has about 600 different ornaments. We've always have just one tree in our home and it is filled with a variety of ornaments. She has some of her great-grandmother's ornaments, ornaments given to my brother and me by family and friends, ornaments celebrating milestones....you name it, she has it. And I love it. Don't get me wrong the pretty magazine Christmas trees with their coordinating colors are gorgeous but I much prefer the type of tree with all your families memories attached to them. When I moved out on my own I was sad because I didn't have my own ornament collection to put on my Christmas tree. Mom was nice and gave me a few that were mine but it still isn't quite the same. So that brings me to the ornaments on this years tree! When Jenny and I were planning out trip to Europe we were talking about the different souvenirs we may be buying while we were there. She said that she already new what hers was going to be...Christmas ornaments. Last year Jenny started a tradition that I have absolutely fallen in love with. 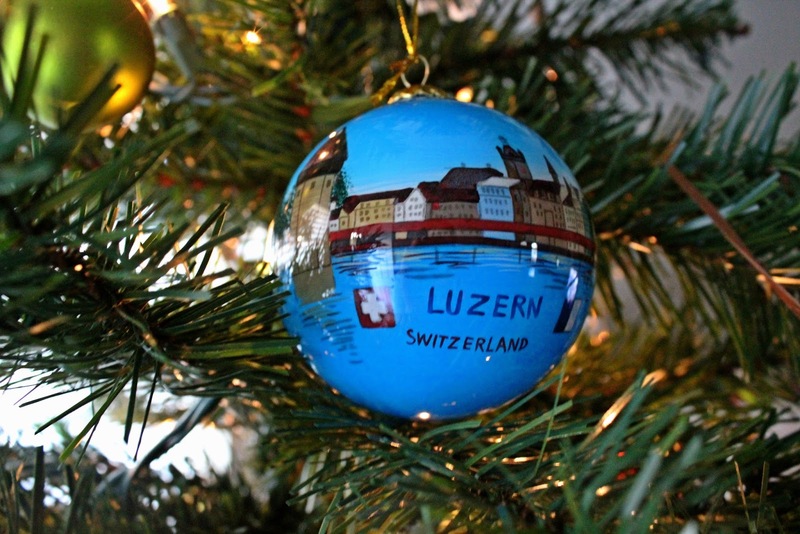 Any time she travels to a new place she buys a Christmas ornament. I mean think about it! It's genius! 1. They are easy to store. 2. You will always use them. 3. Every time you take them out you will be reminded of the city, country, or place you've traveled to and will be able to reminisce about your trip. I immediately asked her if she minded if I started the exact same tradition and she said of course! 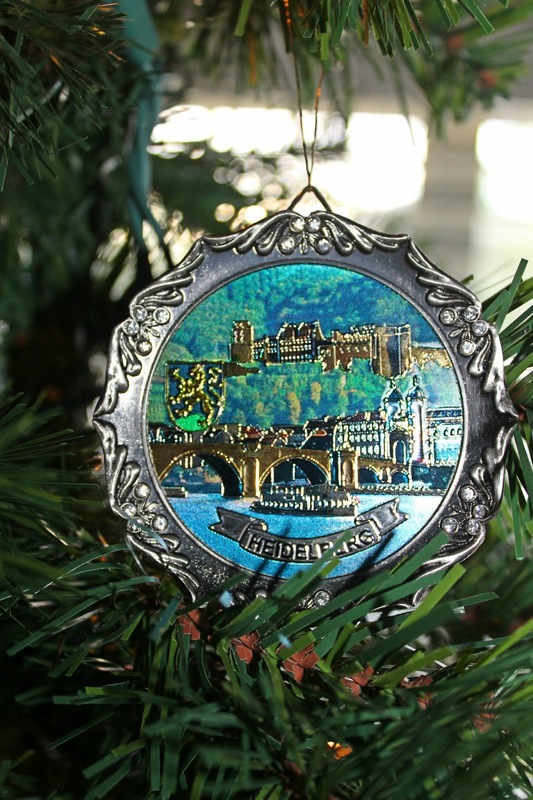 So today I'm going to share all the ornaments I picked up on my European Adventure this summer. Enjoy! I bought this pretty little heart in the gift shop at Kensington Palace jut before we made our way over to The Orangery to have afternoon tea. I have one other ornament from my first ever trip to London and keep it on my mom's tree at home. The first time I was in London my mom and I went together. 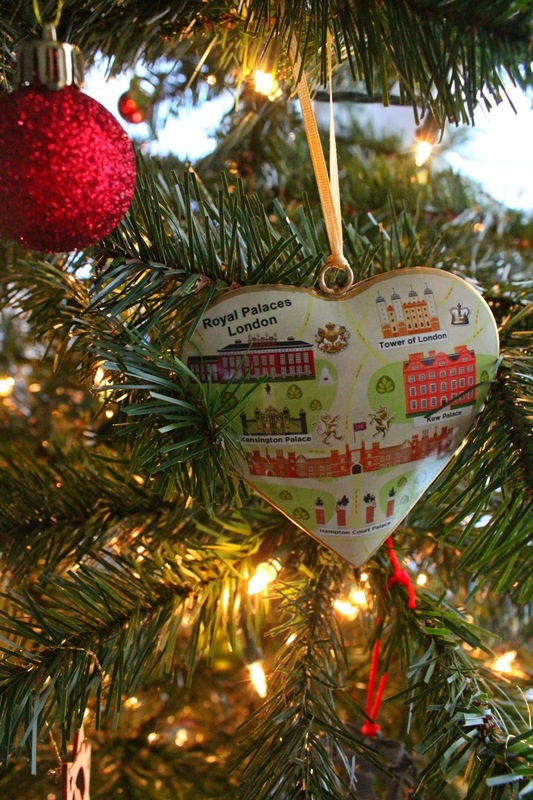 This ornament showcases all the royal palaces you can find around London! Jenny and I actually had a hard time finding ornaments in Paris. None of the little shops we went into had any. It wasn't until we went into the little gift shop out at Versailles that we found a few. I immediately was drawn to this pink fluer de lis. 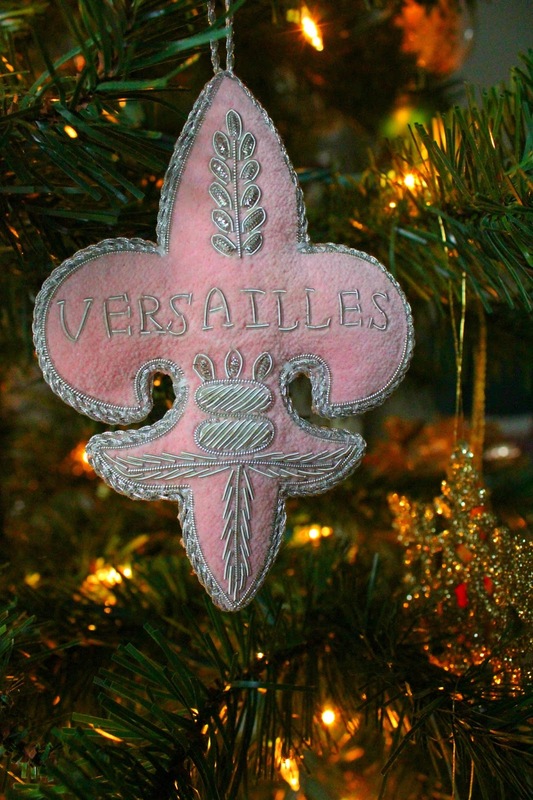 I wish we had had more time to stroll in the gardens at Versailles but I love having this as a reminder of our time there. 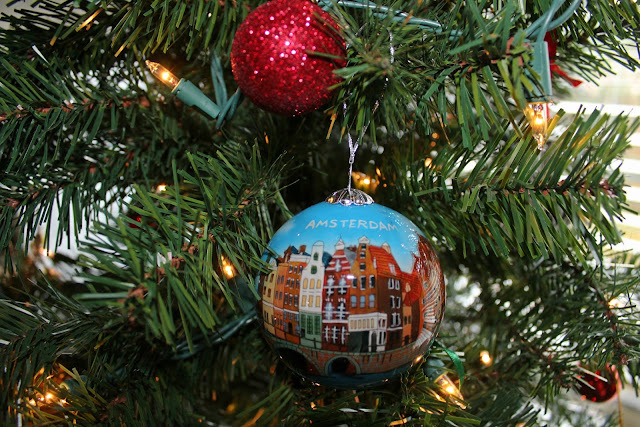 I came away with two different ornaments in Amsterdam. We found this first one in the gift shop connected to the diamond factory we had wandered around for a few minutes. Actually we were expecting to be given a tour of the factory, per the description online and were very surprised when said "tour" was to be escorted up some stairs and told "this is where the diamonds are" and then promptly left alone. But we were very pleased to find the ornament we had been searching for. The other isn't actually an ornament, but I turned it into one. 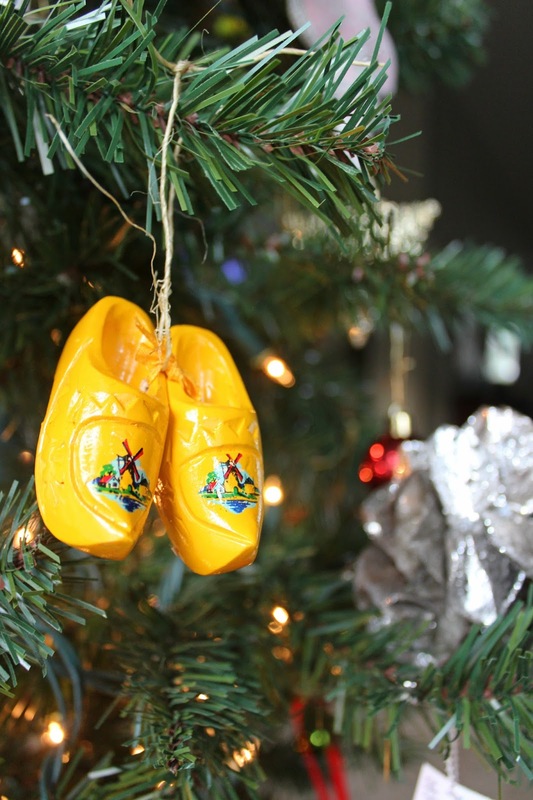 I bought these little clogs at the clog and cheese farm we toured and added some twine to turn it into a cute little ornament. The is was another ornament that technically isn't one. We couldn't find any ornaments that said the words Heidelberg on them so we bought these little plates and turned attached some string and viola! An ornament is made. They did have a tone of Christmas items (hello it's Germany) but we wanted something that actually said the name of the city one it. I did buy both my mom and aunt Christmas themed items while we were there though. A cute little Santa for my mom and a Nutcracker for my aunt. Our main shopping day was on a Sunday in Lucerne and I don't know if you are aware of this but most shops are closed on Sundays in Switzerland. So we were limited to just one shop that was open for touristy type things. Thank goodness they had two of these little babies left. This is probably the most breakable one we bought and sadly Jenny's broke in her bag between Switzerland and Italy. She handled it much better than I would have, so if one was going to break it's a good thing it was hers. I'm 99% sure I would have cried. While in Lake Como, Bellagio to be exact, we found this cute little ornament in a tiny little shop filled with jewelry and other little glass pretties. They had these cute little ones and then they also had a few larger ones but I figured since I already had lots of larger ones a smaller one would be good to balance things out a bit once they were on the tree. Next up was Verona. This one was found in the little gift shop right inside the area where you can see Juliet's balcony and her famous statue. Jenny found it first when we had a few minutes to wander the area. I got separated from her for a few minutes so when we had a little bit of free time we zipped back to the store so I could grab one too. It was the only place we found Christmas ornaments so thank goodness we had time to run back. Venice has tons of little shops lining their very narrow streets. I can't remember where exactly we found these but I do know it took a little bit to find them. It was fun hunting for them though. When we found some we'd shout..."HERE THEY ARE!" And then spend a few minutes finding the one we wanted. I do know that this was the same store I found some very real looking crystal "diamond" studs that I wear pretty much everyday. Our final destination was Rome. 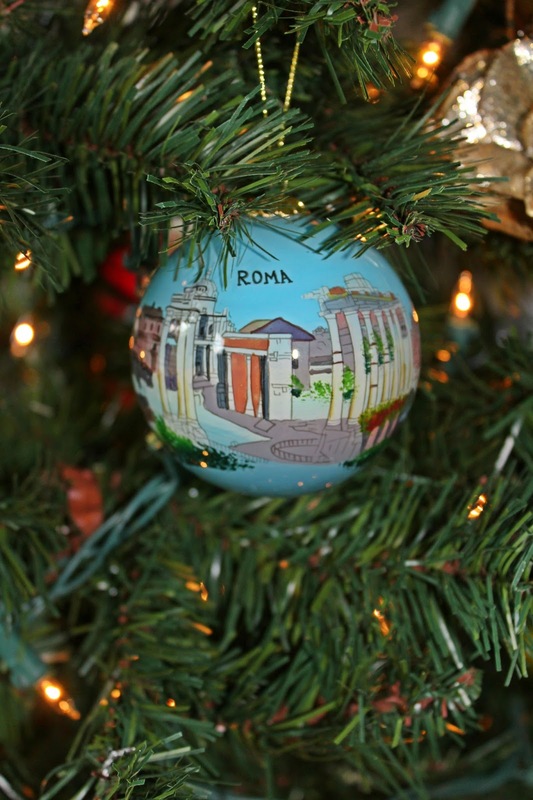 This pretty thing was found in a little shop just town the street from the Trevi Fountain. It started to pour and so we ran into the shop and browsed a little. It was funny because I remember seeing all sorts of ornaments, Disney themed in particular. They're city ornaments were kinda hidden under a few others but thankfully I found them! It was so fun taking all these out of their boxes and putting them on the tree. I was able to relive a little bit of my trip and they look amazing on my tree! I cannot wait to add more ornaments as I continue to travel! 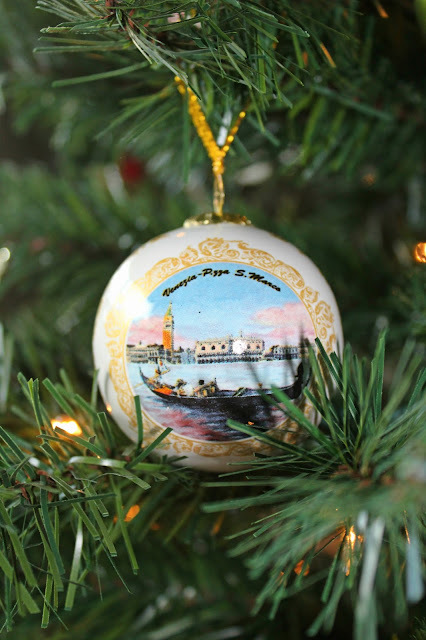 I hoping to go to Washington DC this summer and I'm giddy at the thought of all the different ornaments I can get while I'm there! They are the perfect souvenir! Thanks for the great idea Jen!! So fun!!! And great reminders of your travels! That's one of my favorite souvenirs to get from all of our travels! Like you said, it's the best way to remember trips! And even though the themed trees look really pretty, like you said, it's so much fun to have a tree dedicated to memories. We currently have two trees, one themed and one personal, and I think that we might need a third tree soon! Every ornament is so unique & beautiful! Thanks so much for linking up. Those ornaments are beautiful. LOVE the London one. What a great idea and perfect for remembering all of those wonderful memories!